(Newser) – Some 300 million of the kids on planet Earth are breathing dangerously polluted air into their developing lungs, UNICEF reported Monday, with some 220 million of those living in South Asia. The former number represents one in seven kids who live in areas with high outdoor pollution, notes Reuters, and the results are devastating: Air pollution is a "major contributing factor in the deaths of around 600,000 children under five every year," says UNICEF executive director Anthony Lake. They don't care. Their concern is dust masks are a dangerous trend that will spoil all their efforts of facial recognition. I always get suspicious when I see statistics and the conclusions they jump to. I grew up in the Fifties and Sixties with bad water and air. It wasn't until the Seventies that progress was made in cleaning up the environment in America. We are outliving our parents' generation. 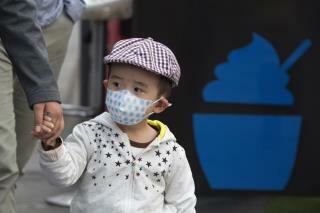 You see much wailing and gnashing of teeth about the air pollution in China. What is never mentioned is that the citizens of China's largest, most polluted cities outlive Americans. Doesn't matter. Shut up and buy something..